We have introduced some changes to the Local CRM in Agent Console to enhance your experience. 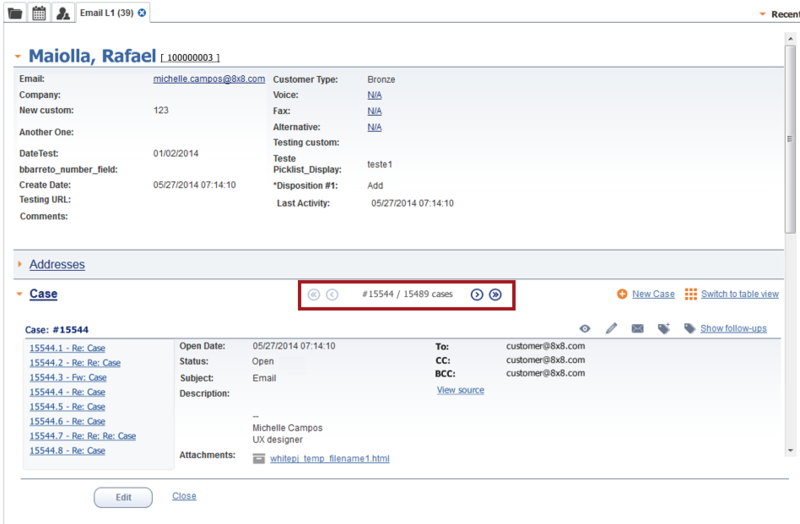 From a customer record, you can click the switch to unitary view and see the list of follow-up records for the case. This helps you find records quickly. During an inbound email interaction from a customer, the screen pop tab that presents the email, displays the case number and customer name. If you have multiple emails opened in tabs, it helps you navigate better. Prior to this release, the tab showed the transaction ID. If a case is created as a result of an incoming email through the email channel, you are able to see To, CC, BCC, and View source fields in the details. 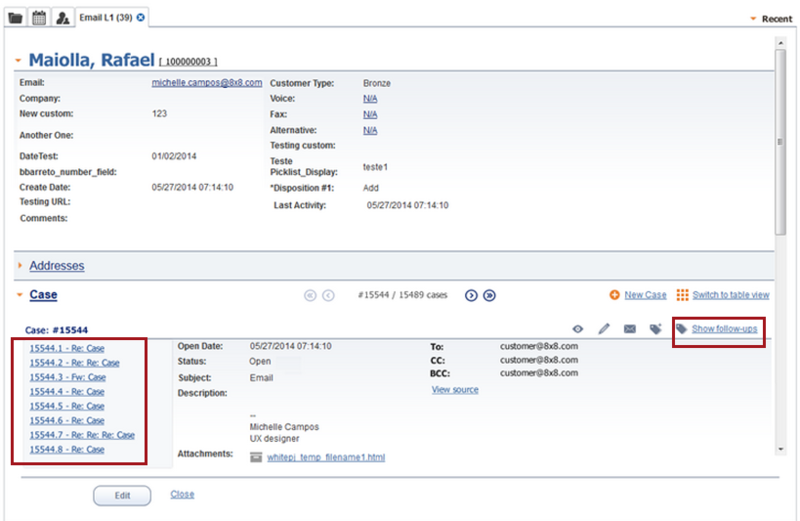 This enhancement enables the agent to know who is Cc'd or BCc'd on the email while still in the customers tab. Prior to this release, the agent had to click Reply button to find this information. In the Agent Console go to Customers tab. Select a customer and open Case to see the list of cases. Highlight a case from the list and select Switch to unitary view. It opens the case detials and shows To, CC, BCC, and View source. Click View source to see the email protocol routing. You can see one case at a time. Use the pagination tools to navigate to other cases. Click to see the entire content. The agents can now view the attachments from the case or follow-up view. Prior to this release, each attachment associated with a case or a follow-up record could be accessed by opening the respective case. With this enhancement, the Attachment tab provides a consolidated access to all attachments related to a case and follow-ups belonging to the case. Ability to sort attachments by name or by date. 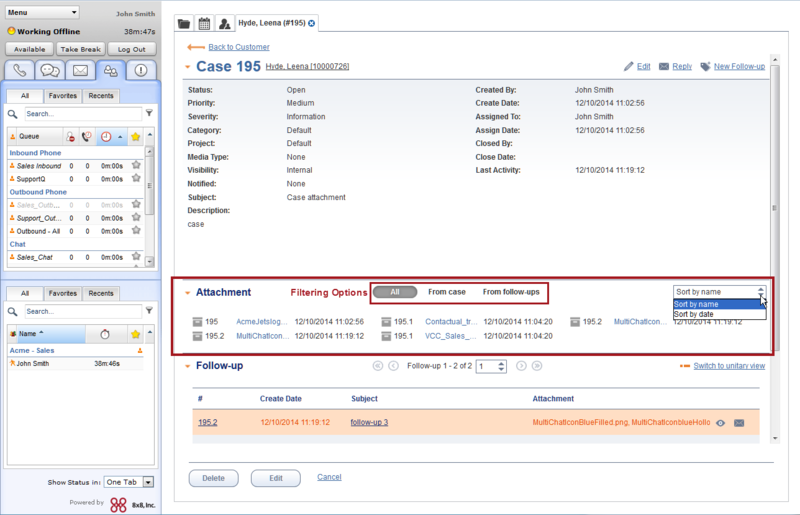 Ability to filter attachments by case or follow-up records. In the Agent Console go to Cases tab and open a case. Click From Case to view only attachments associated with a case. Click From Follow-ups to view only attachments associated with all follow-up records for the case. Click All to view all attachments associated with the case including the follow-up records. The customer name and account number are moved from the details content to its title and appear as a link to open the customer view. 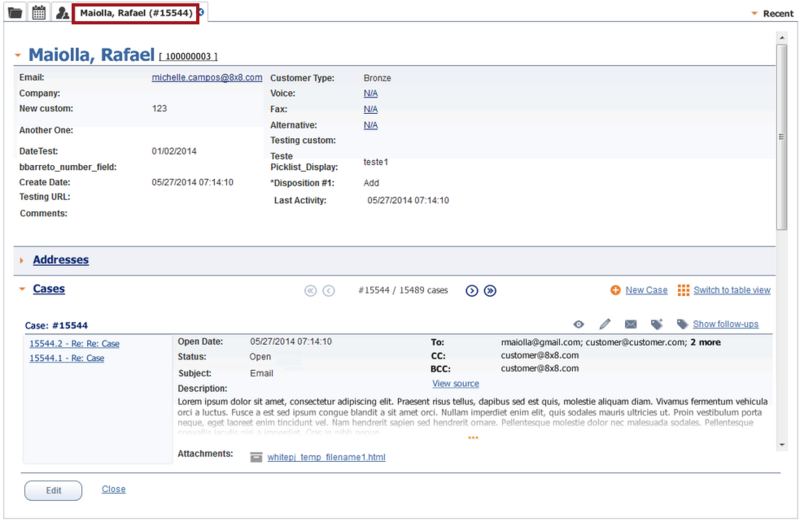 To view the customer name and account number, click on any customer record in the Customers tab. The customer last name, first name, and account number appear as a link in title. 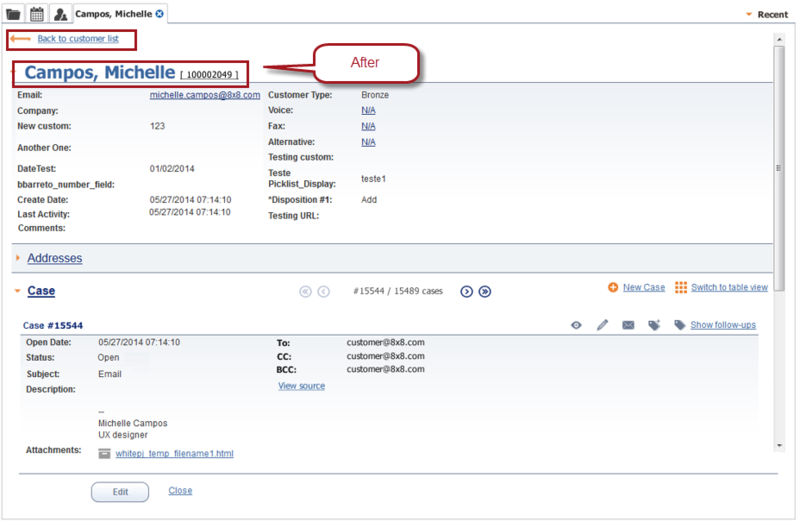 This enhancement also helps with the navigation back to the Customer's information page from the Case window. Back to Customer button is another way to navigate to the a customer's information page. The unitary view pagination shows the case number/ total of cases. To view the case number and total of cases, click on any customer record in the Customer tab. Select Switch to unitary view. The case view and follow-up view description and comment pane can be expanded. It avoids unnecessary blank spaces and content being pushed below the fold. Prior to this release, if a case or follow-up record had long description, you had to scroll down to view the content, with this enhancement, the description and comment panes appear truncated/hidden with an expandable link. Click to expand. Adding a Back to Customer button to the top of the page in Customer, Case and Task tabs improves navigation among CRM records. The screen pop tab header now displays the case ID instead of the Transaction ID that helps agents identify the cases quickly. 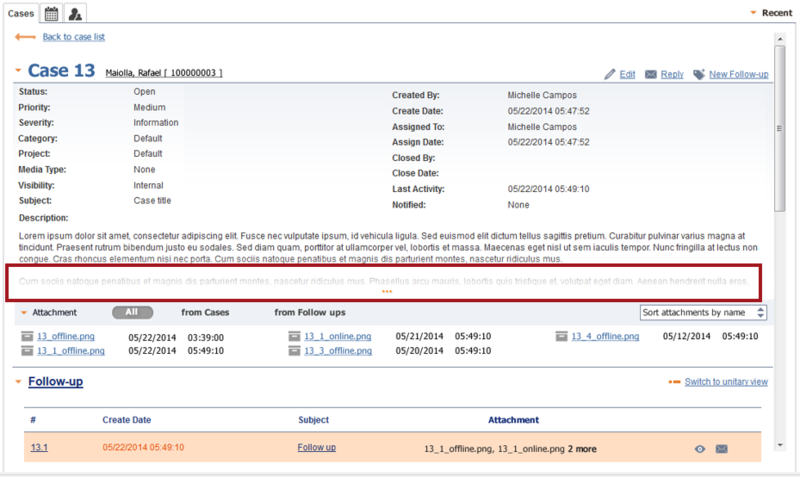 The users can configure the columns order in cases, customers and tasks result page to have them in desired order. To change the order, select and drag the column to the desired location.